had perused in a fairly relaxed way. But we had been looking at actual chalets—we’d seen finished buildings. We’d gone on property viewings where we could step inside the building and enjoy a cup of tea while the current owners talked endearingly about their home like a much-loved member of their family. But Chalet M was different. Because Chalet M, at the time, didn’t exist. Buying a plot of land had never really been on our radar. Building a chalet, from ground up, picking every detail of the interior, deciding upon room size, layout, aspect—it seemed like a huge undertaking. We’d never had a particular longing to build our own home. Luckily for us, our potential new neighbour, did. He was a renowned and well-respected French chalet builder. He was also the current owner of our plot of land and had already put in a planning application for Chalet M. Building our own home suddenly felt a lot easier. The deciding factor for us was his reassurance that, as our neighbour, he was going to spend the rest of his life staring directly at our chalet so he was, therefore, highly invested in creating something beautiful! large in comparison to any bedroom we have ever stayed in on previous ski holidays. The terrace was perfectly positioned. We had those perfect views! For the interior we had perhaps a more modern vision than our builder, who had previously been commissioned to create quite rustic and traditional alpine homes. We wanted modernism and luxury within the wooden structure. So we chose a fireplace and kitchen to reflect this. We didnâ&#x20AC;&#x2122;t want wood throughout the entire chalet so had many of the walls plastered to create a clean modern feel. We also wanted to infuse a sense of our Asian life in the chalet so picked art, furniture and antiques that gave a sense of who we are. Away from Hong Kong this is our home until we eventually move back to Europe. Three particular pieces spring to mind that our guests frequently comment onâ&#x20AC;&#x201D;The Climbing Men from Chatuchak Market in Bangkok, the wooden stools carved from mango trees from Indonesia and The Chinese Opera Drum from Beijing. VIRTUAL TOUR King of the mountain. Thatâ&#x20AC;&#x2122;s what you are. Sat on the sunny side of the town with spectacular panoramic views of Morzine including the slopes of Pleney and the peak of Nyon, Chalet M offers a rare opportunity to experience the Alps on high. At over 300mÂ˛ with 5 exceptionally spacious en suite bedrooms comfortably sleeping 12 people, Chalet M is a perfect mountain home. Just a few minutes from the ski lifts of the Portes du Soleil and less than a kilometre from the town centre of Morzine, Chalet M is central yet remote, accessible yet exclusive. The Living Space Consciously created to offer guests incredible panoramic mountains views, the living areas in Chalet M are truly hard to beat. Relax on sumptuous sofas in the double height living area. Warm yourself in front of the wood burning fire. Sit back on one of the leather armchairs and watch the sunset behind mountain peaks, the crisp white pistes beckoning you from across the valley. Take a seat at the bespoke walnut dining table, handmade by local craftsmen, and get ready to enjoy one of The Boutique Chalet Companyâ&#x20AC;&#x2122;s carefully curated dining experiences. Everything at Chalet M has been considered, from the Tom Dixon lighting to the the hand-picked art from around the world. It is a space to be enjoyed; intimate yet open. Down Time Time spent off-mountain is as important as time spent on-piste, and Chalet M delivers. Curl up in front of a movie in the award-winning private cinema with surround sound and individual chaise-longues—it offers a truly luxury experience. Delve into Chalet M’s collection of books and board games if you prefer off-screen, off-piste fun for your family. Spend a moment in your wine cellar, picking the perfect accompaniment to your BC dining experience. Decide your own personal soundtrack to your holiday using the chalet’s multizone Sonos audio system, allowing you to stream music from your own devices and set your perfect musical scene. Chalet M is about the off-mountain experience as well as the on-mountain highs. The Spa Experience Whether you need to soothe aching ski muscles or you just want to indulge in some luxurious spa treatments, the in-chalet Bamford Spa offers a different level of relaxation. Begin in the glass-fronted sauna where you can let those ski muscles slowly unwind. The hydrotherapy shower will wash away your ski day ready for you to step next door into your Bamford treatment room where Bamford-trained therapists can offer you a selection of massages and treatments using their organic and botanical products. Outside your sunken hot tub awaits with panoramic views of the mountains. Unwind in the bubbles, a glass of champagne in hand, and press reset, because now you are ready for your next day on the slopes. The Terrace Begin and end your days here. The terrace at Chalet M offers you the perfect mountain suntrap. Accessed directly from the living space, walk from your open-plan living area to your landscaped deck where your sunken hot tub awaits, offering uninterrupted mountain views. Spend peaceful evenings warming yourself in front of the rustic fire pit under breathtakingly starry nights. This is the end of the road. This is mountain high. This is Chalet M. Your only job here is to relax. You are king of the mountain yet somehow, perfectly at home. The Bedrooms The bedroom sizes in Chalet M were one of the reasons the owners were so taken with the chalet. All larger than any of the bedrooms they had previously stayed in on ski holidays, the spacious rooms are truly luxurious. With huge, soft beds, balconies, armchairs and Italian showers, they are the perfect space to retreat to after a day and evening spent with family and friends. The master bedroom suite enjoys a private balcony, a separate dressing room, a large bathroom with Italian shower, huge bathtub and double basins. The room configurations will suit most groups, with five en suite bedroomsâ&#x20AC;&#x201D;two with twin or super king size beds, two with fixed king size doubles and a bunk room featuring four full size beds. Most rooms are also suitable for an additional bed or cot. Private driveway and ample parking for 2 vehicles, plus a double garage. 4 of the 5 bedrooms have balconiesâ&#x20AC;&#x201D;the master suite enjoys unparalleled views across the valley to the slopes opposite. 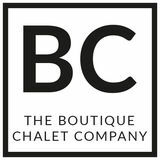 The Boutique Experience As part of our Boutique Collection, Chalet M is an exceptional ski chalet, one of the finest properties in the resort. To complement the superb accommodation and facilities you can expect to be looked after by a team of highly trained professional staff who have been carefully selected to deliver our highly-regarded service package. Champagne corks pop on your arrival, with a Ruinart Champagne welcome reception and an introduction to your chalet team who include a chalet manager, professional chef, driver and housekeeping team. Following a tour of the fabulous chalet facilities there will be plenty of time to relax and settle into your room. Sumptuous beds, Egyptian cotton linen and indulgent organic and botanical bathroom products from Bamford are our standard. When you emerge, rejuvenated, from your room and head for the dining table, our luxurious catered package is one of the most innovative in the industry. Guests can enjoy our signature dining concepts such as Kaiseki—our Japanese multi-course dining experience—and our critically acclaimed Breakfast Club—the finest way to start any day. Drinks are available from our Four Bottles Bar featuring fine wines, craft beers, select gins and spirits and our own cocktail menu. Each day your driver is available from dawn to dusk to whisk you to and from the ski slopes or the village centre, so there is never a need to walk in ski boots. Our après ski chauffeur service means your comfortable shoes can even be brought to the bottom of the slopes for you! 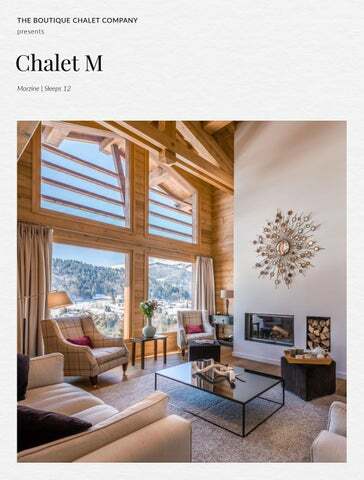 Chalet M is available on a fully-catered, B&B or self-catered basis, for exclusive use of the whole property, or during certain weeks on a Boutique Week (room-by-room) basis. Step inside the wellness suite at Chalet M and you will discover your very own private Bamford Spa. Our partnership with Bamford is one born out of shared values and beliefs. It’s a collaboration that we are very proud of. Bamford is about the simple pleasure of quality. Since 2006, this philosophy has created the purest body care and spa range using only organic and botanical ingredients. Bamford are committed to making truly natural products using the best artisans from around the world. Bamford is authentic luxury – serene, timeless and pure. Bamford’s organic and botanical facials and body massage treatments are individually crafted and deliver a truly relaxing experience in order to unwind after a day in the mountains. It is easy to forget in the midst of a ski holiday that there are other equally exciting things to experience. In reality, such is the plethora of non-ski activities, they warrant an action-packed week’s holiday of their own. Morzine village offers a wealth of such experiences that happen well away from the slopes. From snowshoeing to hidden restaurants away from the crowds to parapenting with or without skis, there is so much to do here... If you already know Morzine in the winter then it will be yours to rediscover in the summer and your love affair may even fall for the warmer season as summer opens up, not just the mountain, but the entire region. The natural beauty is astounding, as are the gifts the mountain gives you in the form of waves of colourful flowers to marvel at, cool freshwater lakes to swim in and weather to warm your soul. When you’re not out exploring the vast playground that is the Portes du Soleil we know that being back home at Chalet M certainly won’t disappoint.